I’ve shaken the wrinkles out of my best robes and dug out the hand-turned wooden wand. The cauldron is cleaned and the crystal ball polished and ready. It’s almost Harry Potter time again. Booksellers and readers are approaching the release of the new book with a mix of excitement and sadness, because it’s the end of an era. 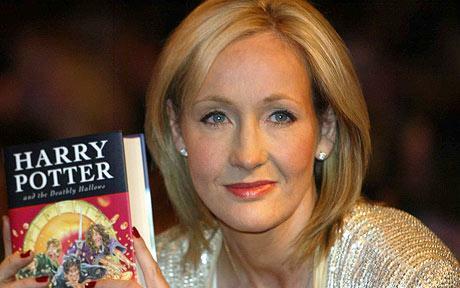 On July 21st, the final installment of JK Rowling’s wildly popular series will go on sale. Actually, most bookstores in this area are planning midnight Harry Potter parties, so a desperate reader can stay up until midnight on Friday July 20th in order to score this long-awaited conclusion to the book industry’s powerhouse. The movies will continue the craze for a few more years but with the release of “Harry Potter and the Deathly Hallows”, booksellers and readers will have one last fling in a phenomenon that has rocked the reading world, a phenomenon that may never be duplicated. What is it about this series? Many books are better written, with brisker plots and more finely-drawn characters. In the earlier books of the series, some of the characters seemed derivative, previously encountered in the classics of children’s literature. Surely we’ve seen three outsiders become friends and allies, we’ve read accounts of Merlinesque wizards with flowing robes and beards, zany but terribly wise. There’s an orphan who is mistreated and his hapless friend from a poor but happy family. And a prep school is a prep school, even if the course-load is geared toward magic. That may be the key to Rowlings’ success. Herbology, Potions, Defense Against the Dark Arts–too much homework, too many tests, too much stress about what to do after graduation. Although the filter of the books is a world where magic-workers and Muggles live side by side, the lives of teenagers and harried adults and teachers rings true with all those groups. None of us know why boys act that way or what girls want. Even if we can raise a wand, mutter some mangled Latin and effect change in our world, the laundry still has to be done, the sprouts peeled, the garden de-gnomed. There is another aspect of Rowling’s work that I am also happy to acknowledge. As a Wiccan, I have watched with interest the attempts to ban the Potter books from school libraries on the grounds that these books encourage children to practice witchcraft. I’ve listened to the pronouncements from several religious leaders in this country and abroad who are concerned about the effects of Rowling’s work on the more impressionable members of their flocks. This foray into young adult literature has distressed people who haven’t even read them but certainly have an opinion of what witchcraft is, what Wicca is and how Rowling conflated the two to create the world of Muggles and Hogwarts that have taken the reading world by storm. Rowling’s work has allowed an important dialogue to begin. When I am asked if witchcraft Hogwarts-style is what Wiccans and Pagans do, it is a starting point for genuine discussion about the use of herbs and spells and potions in my spiritual practice. Adults who have either read the books or seen the movies now have a language in which they can talk about one of the fastest-growing and least understood religions. It has been easy to talk about the obvious differences between what we do and what Rowling has written and a challenge for Pagan leaders to dig into the aspects of Harry’s world that do reflect the work we do as Earth religionists. Though the series is ending, the conversation will continue, to the advantage of all concerned. The countdown has begun to midnight, July 20th. Who is “R. A. B.“ and how bad is Severus Snape? Soon we’ll all know, as we munch pumpkin pasties and wear our dress robes one last time. Now, where is that Firebolt? Accio, broom!